the days here in Prague are getting longer so the afternons (and evenings) in the office are becoming less and less depressive. We have been working with a good consistent effort for the past week and the results are imho there. So the 0.11.16 (the bug version number is getting scary big) has been released yesterday. We have spent a lot of time preparing it and so far it looks like there are no major issues with it. We will get a better picture after the weekend during which the players will have time to test it. But it slowly starts to look like there is the light at the end of the tunnel. So maybe as the winter here is beginning to change into the spring (beautiful sunny yet cold day today) we will emerge with a stable 0.11 release and start working on the endgame prototype. However, the 0.11.16 doesn't have ambitions to become stable as we still have some bugfixes in plan and there will be bit more refactoring and improvements in the multiplayer logic. But we are getting there. Oh yeah and the autosave needs to be coordinated in the multiplayer (otherwise the game just freezes for couple of seconds when someone is autosaving). 1. Building a silo on the ground and sending necessary material to the orbit via rocket launches. This will be the production part. 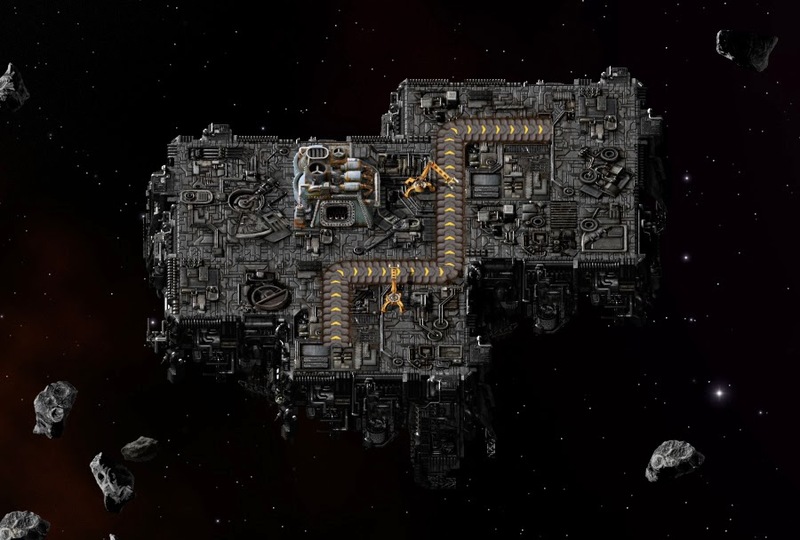 The spaceship parts will require a lot of resources and your factory needs to provide them. 2. Building the ship on the orbit. This will be the thinking part. Basically you will need to build a small fully automated factory on a space platform. 3. Running the simulation. This will be the movie part. You can sit back and see whether the ship you built stands the test of rescuing the fellow citizens. The picture above shows our white board (quite an improvement compared to the whiteboard we used for multiplayer planning :)) after the brainstorming session. I would just like to repeat that this is still in the planning phase. We have some graphics already (the silo, the rocket and the space platform) done but the prototyping will begin only after 0.11 is finished. The plan is to start with the simplest prototype possible and then iterate until we get to the point where we are satisfied. We are aware that there will be many differences between the endgame content and the main part of the game. However the core concept remains the same: building automated systems. We really want to avoid making another game for the endgame content, on the other hand we feel that Factorio deserves a really good ending and we believe this will be exactly that. While Pavel has been busy with the silo and the rocket, Albert has been working on the tilable spaceship platform. After many experiments and quite some hard work the platform is ready. You can judge for yourself below. The next challenge for the gfx guys is going to be the general space aesthetics (the background, the asteroids, the stars, etc.) and the new entities for the space platform.